I heard a great line at IBC, which I think sums up where we may be getting to on our exponential acceleration towards a grinding halt in broadcast technology. One of the major lens manufacturers was proudly showing off their new telephoto lens, which is now by far the longest lens in the market. The response I got when I told a friend about this new amazing piece of technology was “I didn’t realise they are making football pitches bigger nowadays”. And in that pithy comment may lie a fundamental issue for kit manufacturers….why are they making it? 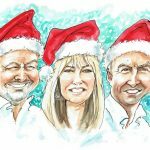 If the market is demanding the product, it saves the customer time or money, or it’s a new workflow concept, then that seems like a perfectly sensible commercial decision. But I think my friend’s point was that they just built it because they could. The current crop of sports OB lenses can frame a player’s face from the stanchion of the largest stadium, so what benefit is there from zooming further? Can the same be said for the K race in camera technology? 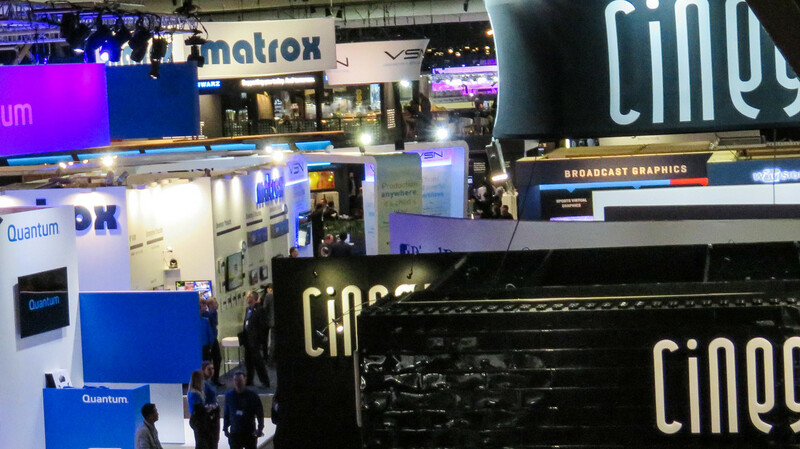 Some of the images I saw at IBC were incredible. The Sony big screen was staggering, and the images of the World Cup that were showing in the NHK Futurezone were captured and displayed in 8K and were as good as we can create currently. But I’m told that we’re getting to a point where the human eye just can’t tell the difference any more. The jump from SD to HD was seismic. HD to 4K less so because to notice the improvement the screen size required was so significant. Can I honestly say that I could tell good 4K footage from 8K footage? I’d need a really big screen or a magnifying glass to tell the difference for sure, and I don’t have, or want either. Clearly advances like HDR, where the benefits are noticeable, regardless of the screen size, will win out over just squeezing more pixels in. Netflix seemed to feature in so many conversations, and all of the FAANGs will have a major part to play in the next few years of the industry’s evolution. In a field ripe for disruption, and billion-dollar balance sheets behind the biggest players, the broadcast industry is a prime target. Even the term “broadcast” sounds out-dated. Facebook’s new on-demand service “Watch” seems a more apposite term. A verb; a doing word which is something that the consumer does by choice, rather than has done to them. The hotel and taxi industries have been disrupted beyond all recognition by smart people leveraging new technology to offer an improved customer experience. Airbnb welcomed their first “guest” in 2007, and Uber their first “ride” in 2010. Neither own their own rooms or cabs, and as I walked out of my Amsterdam canal-side AirBnB apartment each morning and got in to the Uber that I’d requested just 5 minutes earlier, the benefits of both were obvious. So, to the show itself… I had made a plan (In my pre IBC blog) to spend less time walking the halls, and more time learning and engaging. I’m now much more up to speed with the work of colourists, thanks to one of the excellent talks moderated by Jake Bickerton, and featuring Goldcrest senior colourist Jet Omoshebi. She was knowledgeable, eloquent, and engaging. There were others too; on sports technology, where Dolby did a great job promoting their technology, and an interesting session with the 50 foot face of movie director Doug Liman who skyped in to his seminar, having been called away at short notice. These were all in the Big Screen theatre, and congratulations to the organisers of these sessions. So often the content at these shows is ruined by poor technical facilities, and in all of the sessions I attended, the mics worked, everyone could be heard, and the clips played on time. I hope other trade show and seminar organisers take note. As for kit, I found some interesting new technologies, and some clever upgrades, but nothing game-changing. Did I miss something? Long barrel lenses have always been demanded by Natural History cameramen understandably keen not to get too close to the polar bears they’re filming. But the issue has always been to keep the shot steady. Fujinon have developed a magic button on their new 46x lens which stabilised the image impressively. I gather it’s proving popular. Cooke are continuing the Stella Artois mantra with their new full frame anamorphic lens line up. The 50mm will be the available first, with a further six in the range to follow. The stand proved as popular as ever, so the “Cooke look” isn’t likely to fade any time soon. I like the NCAM technology. To be honest, it’s been explained to me before and I didn’t really get it, but seeing it demonstrated, it all clicked. It seems to have been developed primarily to allow the cameraman to frame the shot correctly so the human actor can engage with the CG monster/hobbit/elf realistically, and in the correct position. It seems obvious, but the savings in post-production on a major feature film are potentially huge, far outweighing the cost of deploying the kit, so I think it’s going to be a success. 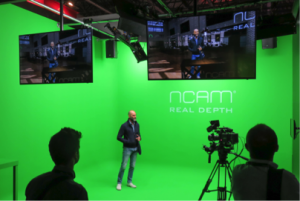 They have also developed it to create a virtual studio set, allowing a presenter to walk “behind” a CG desk, and for them to see where they are positioned via on-set screens. It would take some practice from the presenter so they don’t stand “in” the table (as in the photo), and whilst this isn’t the only virtual set solution, it’s a clever secondary use of the technology. 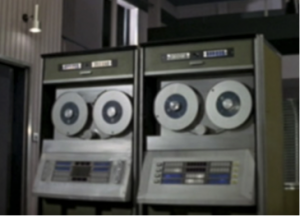 Film scanners have always been a bit of black art to me, and have always looked to be from a bygone era, like the Turin traffic control centre in The Italian Job. 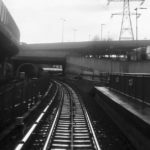 But spending some time with DTF enlightened me, and the demand for silver halide film to be digitised at higher resolution, and more quickly than ever, is huge. This isn’t just driven by new content shot on film, but by the millions of feet of archive footage that the plethora of new TV channels are demanding. 1960’s Turin traffic control system ? DTF has developed a nice product called Wetgate which speeds up the restoration process. It’s a self-contained unit that fits in to their standard Scanity film scanner, and is filled with a liquid which has the same reflective properties as the original film coating. The liquid essentially fills in the shallow scratches in the film coating which accounts for many of the imperfections in the film. 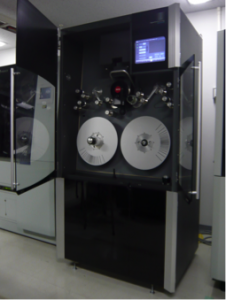 As a “first pass” in the restoration process, it is so much quicker than treating the entire roll of film before digitising, and restoring each frame by frame image. It’s not new for IBC 2018, but it’s new to me and I liked it. The way in which regional news is delivered back to base has changed hugely as budgets have been driven down. 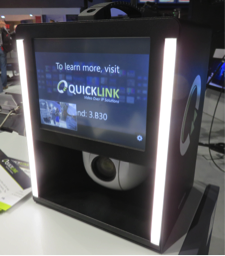 Panasonic and Quicklink have teamed up to make a neat solution for getting “talking head” pieces back to the studio. The Quicklink box is IP connected, the screen can be used as a prompter, it has 2 way comms to the studio, the light strips on either side give an element of control of the image, and the inverted PTZ camera gives a pretty decent image. It can also be battery powered, and if you add a LiveU you have a truly portable remote production unit for the tightest of budgets, the smallest of luggage allowances and the most basic technical knowledge. 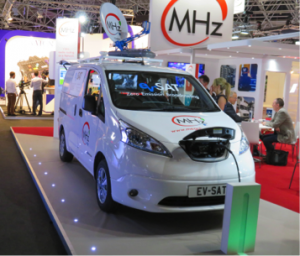 There was a world-first on the Megahertz stand where they presented the first battery powered uplink vehicle. I gather the BBC are in the queue for a few, and with most city centres mandating Euro6 emission standards now, this seems like the way forward. If only broadcast glue wasn’t so heavy. Battery life has long been the limiting factor with electric cars generally, and if you add in a heavy kit payload it makes it a solution for certain applications only, but it is undoubtedly the future. The large kit manufacturers that I heard from seemed to have broadly similar sentiments. The US market was a little flat, but Europe has been good to them. There was a time when the US TV business was Never The Same Colour. Now perhaps it’s Not The Same (sales) Cycle? That was an engineering joke for those of a certain age in case you missed it. And as far as new technologies go, the BBC announcement claiming that they have found a cure for the delay in IP signal distribution could be game-changing, and I’m curious about how that will affect remote production if it does what it says on the tin. And AI was a hot topic with the drive to automate simple repetitive tasks being the lowest hanging fruit for this technology to be utilised in. But there are already plans to automate editing and directorial decisions in sports programming, which is extraordinary. So what did I miss? I’ll have missed far more than I saw, or caught my eye sufficiently to include in this piece. It seemed quieter to me. I left on Sunday night, so how was Monday and Tuesday? 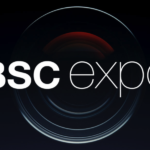 During my time at IBC, I spoke to lots of people who told me they read and enjoy my musings, which was good to hear, but a conversation is far more stimulating when several people are involved, so please do add your thoughts and comments.